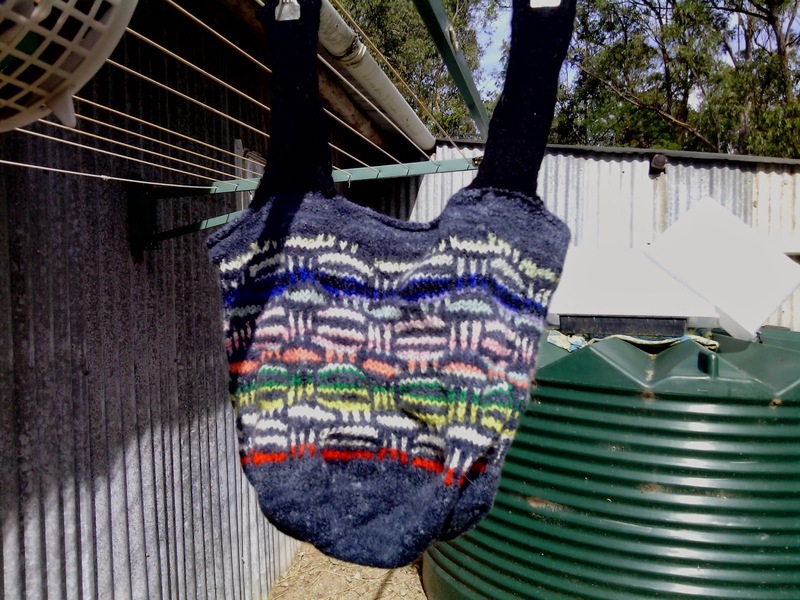 This is the final step in the making of a tote bag from scratch; felting (or fulling). First let me explain the difference between felting and fulling; felting is the actual process of entangling fibres tightly together to make a solid material, raw wool is felted. Fulling is the process of partially felting knitted items to provide a stronger bond between stitches, knitted items like my bags are fulled. The process for felting or fulling is the same; everything your mum told you not to do with knitted clothing in the laundry. If you are interested in wet felting wool, follow the link to a good tutorial. My licorice allsorts bag, all ready to be fulled. 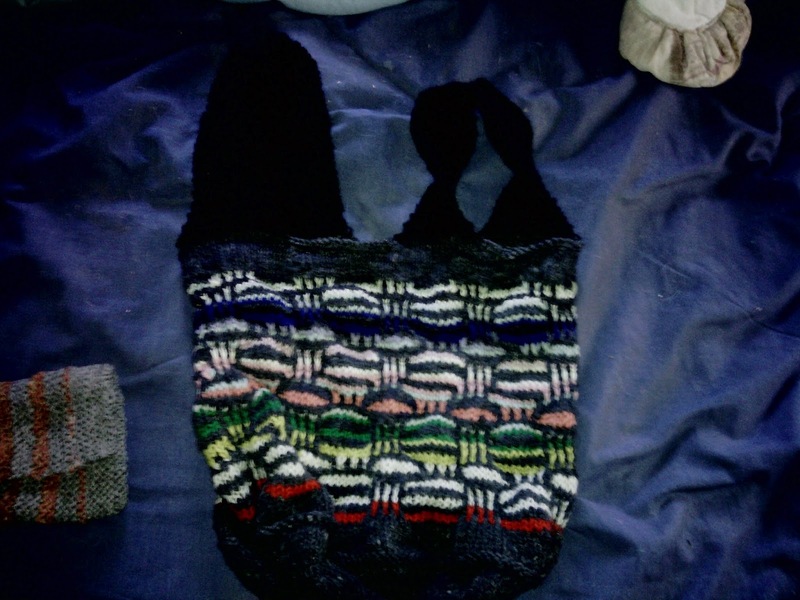 The bag is knitted up and looks just like licorice allsorts to me, so that’s what I called it. 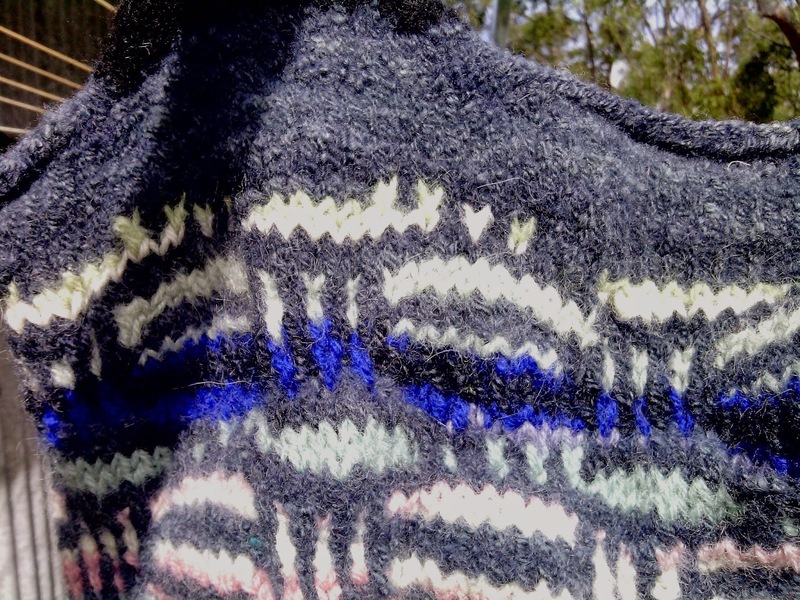 The exciting thing about fulling knitted items is that you can never be sure how much or how fast the felting process will go, so the results are infinitely variable. First I fill the washing machine with cold water and add some shampoo (which seems to make fulling go faster) I only just cover the items to be fulled so the water level is low. Then I switch the machine on (after fueling and starting the generator as we have no 240v electricity) and let it wash for a while. In the meantime I boil a big pot of water on the wood heater. Once the water is boiling I carefully carry the pot into the laundry and tip the hot water into the washing machine, this temperature change is generally enough to ‘shock’ the wool into felting. I then spin out the item and hang it to dry while stretching it into the shape I had intended as far as possible. My bag after fulling, hanging in the sun to dry. An example of the unpredictability of fulling; the dark blue and black stripes didn’t felt as much as the other colours. That is the end of the journey from fleece to tote bag. As you can see; it takes a while to get there, but the results are worth it. Did you enjoy this series? Should I do more of them? What else would you like to read about? I enjoy your adventures with wool of any kind Jude! Thanks Duchess, I enjoy them too. Maybe a series about cotton, from plant to yarn?